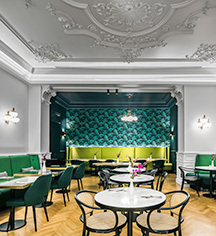 Featuring a friendly atmosphere and a year-round glass enclosed veranda space, La Veranda restaurant offers the freshest ingredients and internationally styled dishes with a Czech touch. 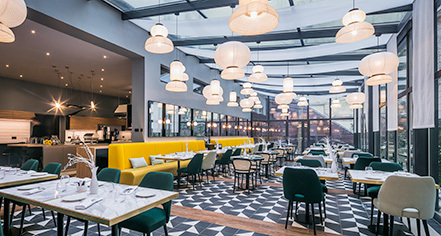 Guests will be able to enjoy peace and tranquility at this city-center restaurant, which was inspired by the 19th century Cubism art movement and Art Deco design. Enjoy a refreshing cocktail, gourmet dishes, and delightful desserts at La Veranda during lunch and dinner. Lunch: Daily, 12:00 p.m. - 2:30 p.m.
Dinner: Daily: 6:30 p.m. - 10:30 p.m.